Bananas, avocados and mangos grow prevalently in South Florida, are also vulnerable to a number of agricultural diseases. Randy Ploetz is an authority on diseases that affect tropical and subtropical fruit crops, and his goal is to manage them in an effective and environmentally-benign way. “South Florida is the only region in the continental United States where many of these crops are grown, and there is limited information for many of the prevalent tropical diseases and pathogens,” Ploetz says. 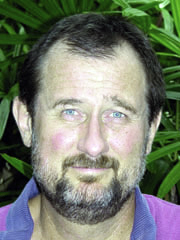 Ploetz’s research includes the development of root rot-resistant avocado rootstocks, an explanation for mango decline, and fundamental insight into Panama disease which affects banana plants. Ploetz’s research will help develop disease-resistant genotypes of banana and has already been used widely when deploying new cultivars.